Rob Scuderi now knows that experience in the Stanley Cup Final is a huge advantage. Get your "Gold & Black attack" tee now! 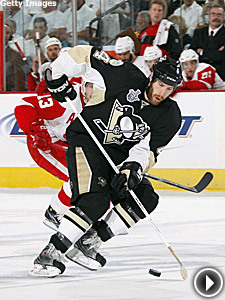 PITTSBURGH – Rob Scuderi has heard it his entire life from players, coaches, teammates, and friends. They would tell him that just getting to the Stanley Cup Final is not enough. Winning the big prize is all that matters. Now that the Pittsburgh Penguins 29-year-old defenseman has been there and failed to do that, he can honestly say what everyone used to tell him is just a bunch of baloney. Experience was the buzz word as soon as the Final began. The Red Wings had it and the Penguins didn’t, so clearly the Red Wings had the edge. Eventually that proved prophetic since nerves played a part in the Penguins’ poor start in Detroit that they couldn’t overcome, but even though they were ousted in six games by the better team, the Penguins say they soaked up the Stanley Cup Final atmosphere and loved every second of it, save for the result, of course. All but four players on the ice for Pittsburgh Wednesday night had never played in a Stanley Cup Final game before this season, but every single player wearing a Penguins uniform had thoughts regarding of what the event would be like. To most, the Stanley Cup Final experience matched their expectations. Except for one important thing: The Penguins came into it so confident that they just figured they were going to win. That’s why this still confident group is also a humbled group today. Still, the Penguins played nervous in Game 1, and rightfully so. But as the series continued, Penguins coach Michel Therrien sensed his team was embracing the Final experience of playing because it got better after each game. Evgeni Malkin said the Penguins learned how to never quit in this series. Penguins veteran Gary Roberts stressed that despite the sad outcome, this experience should only be viewed as a positive by Pittsburgh’s 19 first-timers, including Ty Conklin, Dany Sabourin, Jeff Taffe and Kris Beech, who all didn’t play in the playoffs, but were working and watching every single day. Many believe losing at this stage helps, too, because adversity builds character. For evidence, just look McCarty and teammates Kris Draper and Nicklas Lidstrom. They all played on the 1995 squad that got swept in the Final by New Jersey. A year later, Detroit lost in the Conference Final to Colorado before winning the first of what on Monday because four Stanley Cup championships. Remember also that the Edmonton Oilers lost to the Islanders in the 1983 Stanley Cup Final before starting their five championships in seven seasons dynasty the next season. The Devils lost to the New York Rangers in a memorable seven-game Conference Final in 1994 before winning the first of their three Stanley Cup championships in 1995. Tampa Bay also lost in the Conference Semifinal to those Devils in 2003 before winning the Stanley Cup in 2004. And, Anaheim lost to Edmonton in the 2006 Western Conference Final and won the Stanley Cup the next year. Right now, the Penguins don’t care too much about that. They lost in the Stanley Cup Final and it hurts like heck. However, deep down they already know this experience has made them a better team and better players.